Lua error in Module:Location_map at line 488: Unable to find the specified location map definition: "Module:Location map/data/Cuba" does not exist. 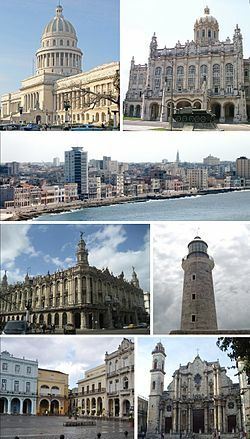 Havana (Spanish: La Habana) is the capital city of Cuba. Its population was 2.1 million in 2012. It is at 23°8′N 82°23′W and is a little more than 100 miles south-southwest of Key West, Florida in the United States. Havana is a very old city. It was created in 1515 by Spanish explorers.Due to its important location it became a springboard for the Spanish conquest of the Americas. Also, it became a stopping point for Spanish ships returning to Spain filled with treasure. King Philip II of Spain granted Havana the title of City in 1592. Walls as well as forts were built to protect the old city. The sinking of the U.S. battleship Maine in Havana's harbor in 1898 was the immediate cause of the Spanish–American War. ↑ "How Obama's US-Cuba deal could shape Havana's future". Lonely Planet. Archived from the original on 10 January 2015. Retrieved 10 January 2015. ↑ 2.0 2.1 "2012 Official Census" (PDF). This page was last changed on 5 March 2019, at 11:12.